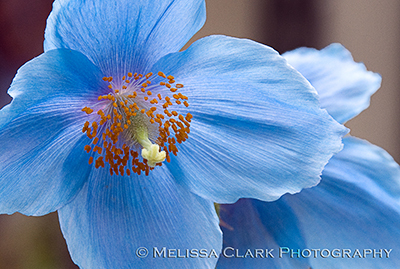 Meconopsis, the most beautifully blue flower of all. And no, it doesn't grow in my garden. Maybe it’s because I have blue eyes, but long before I became a gardener, my favorite color was blue. Cobalt blue, robin’s egg blue, sea or sky blue – it didn’t matter, as long as the basic color was blue. These days I make my living designing and photographing gardens, and although my own tastes have expanded to other colors, I’m often asked to include blues in the landscapes I design. Several years ago, after reading an article in The Garden Letter on reds in the garden, I was inspired to walk through my yard, notebook in hand. To my surprise, I discovered that my old subconscious affinity for blue has resulted in having more than twenty plants with blue flowers, blue foliage, or a combination of the two. Here are some of my favorites. Early bloomers include Scilla siberica (Siberian squall), which for me appears with ‘Tete-a-Tete’ daffodils and Mertensia virginica (Virginia bluebells). I grow them under a huge beech tree in a bed of vinca that disguises their dying foliage. 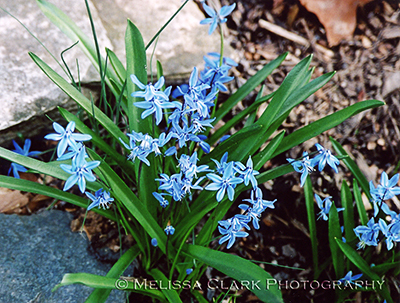 A clump of Scilla siberica in my garden. 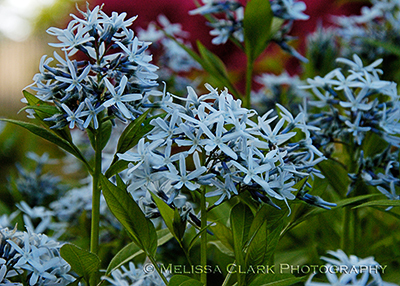 Then comes Amsonia tabernaemontana, the blue star flower. 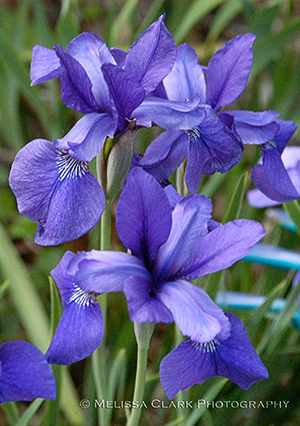 Its blooms are a mixture of a very dark blue and a lighter blue as they start to open, changing to sky blue completely. 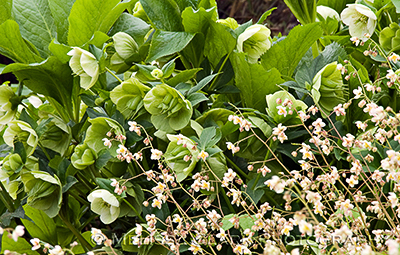 In the fall, this perennial’s foliage turns a lovely golden yellow and lasts until frost. Amsonia 'Blue Ice' shines in both the spring and fall. Amsonia blooms about the same time as Iris siberica ‘Caesar’s Brother,’ a lush, velvet blue. Festuca 'Elijah Blue' has blue-gray foliage, which appears more green than blue in this photograph. 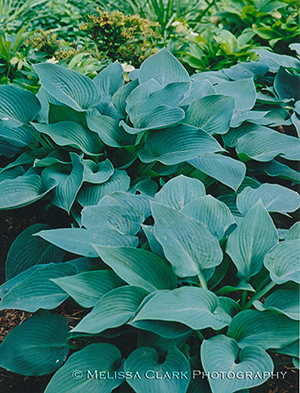 Hosta ‘Halcyon,’ one of the classic blue hostas, serves the same function, and when grown in the right amount of shade, its leaves can look almost purely silver-blue. Blue-gray leaves of Hosta 'Halcyon' on the front hill of my garden. 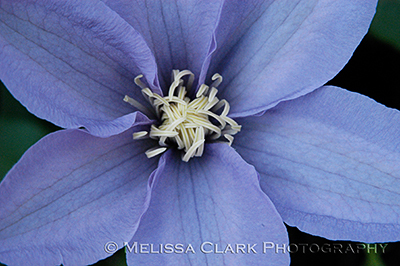 Some of my favorite blues (aside from the gorgeous Meconopsis at the top of this post), however, are found in the clematis family. The two large-flowered blue varieties I’ve grown for the longest time include ‘General Sigorsky’ (although recently the deer seem to have developed a taste for it), shown here on my rickety wooden arbor. This general deserves a blue ribbon. 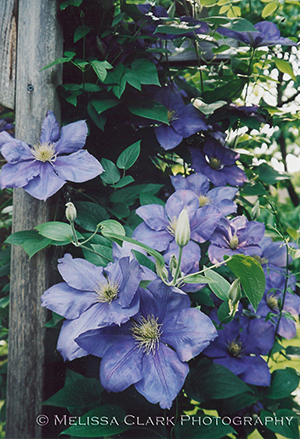 My other blue clematis is ‘H.F. Young,’ which I’ve also planted successfully for clients with similar penchants for blue flowers (and fewer deer). I’m done for today. You probably have your own favorites – let’s hear about them, and post some photos on your own blog so I can check them out! My garden is about eighty percent shady. This despite the fact that my back yard has a southern exposure. Shade happens when you live in a neighborhood of huge mature oaks and beeches, and your neighbor to the rear has about 15 of them in her back yard. So when I became an avid gardener, I quickly learned to look for and use planting combinations that work well in non-sunny sites. This combination caught my eye the other morning as I headed down my front steps to fetch the morning paper. The front yard faces north and slopes steeply. The Skimmia japonica I planted in 2001 has spread to act as a groundcover of sorts (the ONLY site where I have seen it be so successful!) 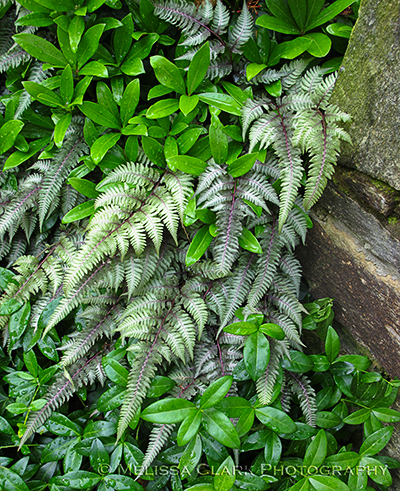 and is encroaching on my Japanese painted ferns (Athyrium nipponicum ‘Pictum’). Every year I debate moving the ferns but I love their delicacy and the color and textural contrast they provide between the skimmia and the vinca. 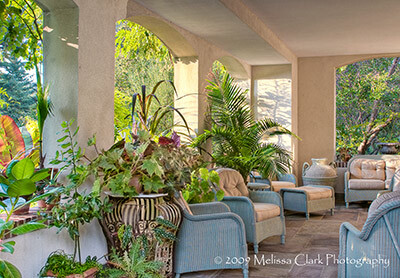 This fern is versatile and sophisticated. Here it is in Sally Boasberg’s shade garden in DC, paired with astilbe underneath a dissected Japanese maple. 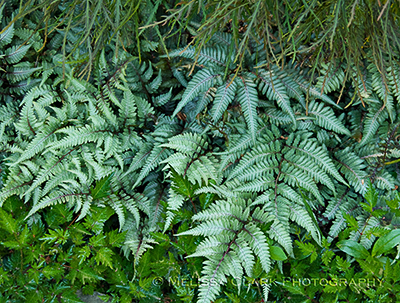 Here the painted fern's fronds contrast beautifully with the darker green leaves of the astilbe. Another favorite combination from my own garden is variegated Solomon’s seal (Polygonatum odoratum ‘Variegatum’) with Northern maidenhair fern (Adiantum pedatum). They are both much tougher than they appear; the Solomon’s seal is a favorite choice of mine for dry shade. Although you need to be patient, over time a single quart-sized plant will made a sizeable clump, not unlike hellebores. Variegated Solomon's seal arches over whorled maidenhair fern foliage. Speaking of hellebores, they are at the top of my go-to list for shade groundcovers. Drought-tolerant, deer-resistant, self seeding (but slowly), they provide flowers at a time of year when almost nothing else except the earliest bulbs are awake. Here is a clump from Brookside Gardens (in Wheaton, MD), combined with epimediums blooming in early spring. Pure magic. I can hear the colorists whispering restlessly in the background. OK, here’s a shot of screaming color that will brighten any shade garden. Although I show it alone (and apologize for the quality of the photo, as the colors are hard to capture accurately), Spigelia marilandica (Indian pink) plays nicely with more boldy-foliaged plants and some of the larger ferns, such as Christmas fern. It will grow in sun OR shade. Mine are in filtered shade and have self-seeded a bit over the years. They are a little late to emerge in spring, so be patient and don’t give up on them if you don’t see the foliage emerging right away. Great for hummingbirds! 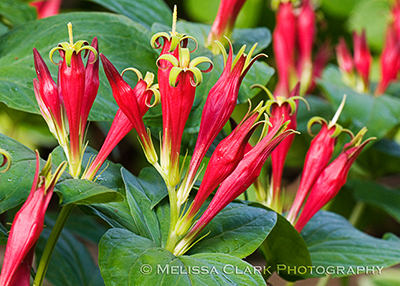 The blooms of Spigelia marilandica, even in shade, are a vivid red and chartreuse. 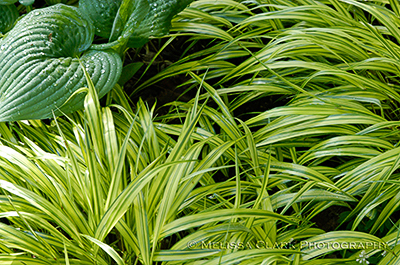 I’ll close with one of my absolutely favorite shade plants – variegated Hakone grass (Hackonechloa macra ‘Aurea’). It is slow to establish but once it’s happy, it will spread almost indefinitely. I like mine planted with a blue-hued hosta or two, comme ca. I’ve only begun to scratch the shady surface of my yard (and others’). 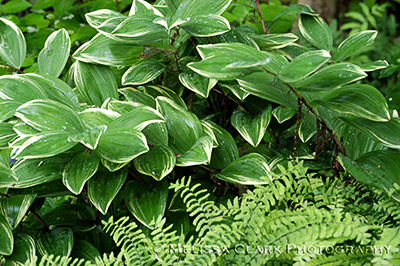 I could – and will – do posts solely on my favorite hostas and hydrangeas. In the meantime, I would love to hear from any of you about your experiences with these or other shady beauties. 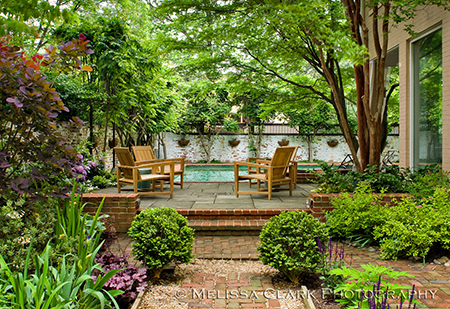 The Sessums/Biles garden in Washington DC, one of six private gardens scheduled to be part of the May 22nd Open Days tours. The garden recently won a Perennial Plant Association Merit Award and has been recognized as a Certified Wildlife Habitat by the National Wildlife Federation. After the horrendous winter we had in my area, we are all ready for spring, and to spend some time in a beautiful garden or two. 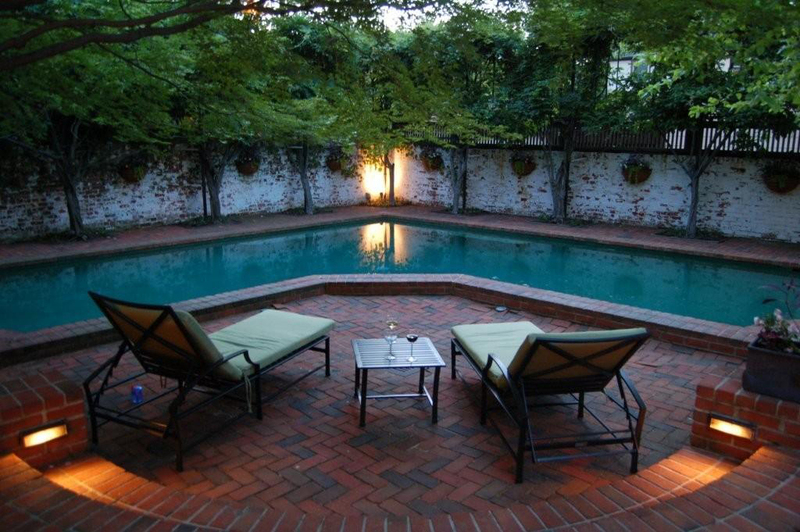 On May 22nd (and again on September 25th), you’ll have the opportunity to do just that, courtesy of The Garden Conservancy’s Open Days program here in the DC area. Established in 1989 by Frank Cabot, the distinguished American gardener, The Garden Conservancy’s mission is “to preserve exceptional American gardens for public education and enjoyment.” To date, it has spent nearly $9 million helping over 90 important gardens in the US survive and prosper (most recently, Longue Vue House & Garden in New Orleans and Alcatraz Island in San Francisco). 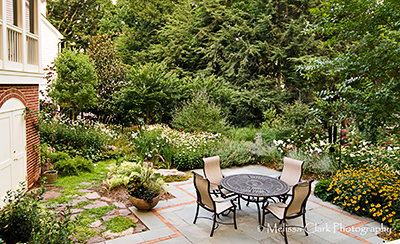 Across the country, The Conservancy sponsors a series of Open Days in which the owners of special private gardens welcome visitors for a day to learn more about gardens, plants and design. The program is based on England’s National Gardens Scheme. 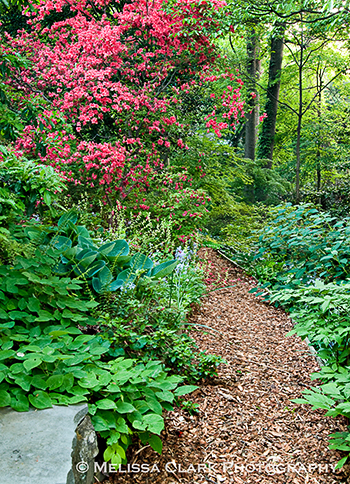 This year, more than 350 private gardens in 22 states will be on display. The Boasberg garden in early spring. and another was originally designed by the famed landscape architect Thomas Church. 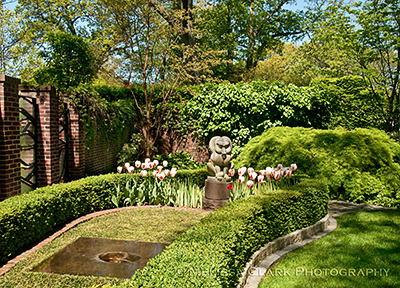 Another view of the Auclair-Jones garden, originally designed by Thomas Church. Two other interesting gardens on the tour have connections to the design firm where I work. One of them, the Sessums/Biles garden in AU Park, was designed by H. Paul Davis, ASLA, the landscape architect at American University. Installed by our firm , the garden incorporates an imposing array of perennials, native shrubs and small specimen trees into an existing woodland setting. The owner is involved in maintaining the garden, composting plant material, capturing rainwater for re-use, and eschewing irrigation and the use of pesticides except for treating some mature hemlocks with wooly adelgid problems. 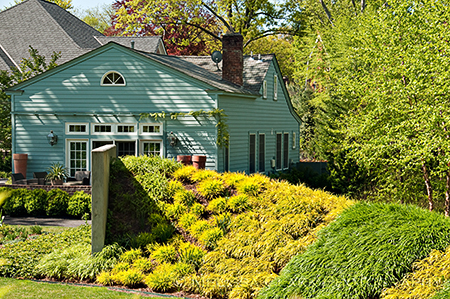 Recently, the owner and designer received some very exciting news: the garden has received a Merit Award in the 2010 Perennial Plant Association’s Landscape Design Awards competition. The back yard of the Sessums garden, where all plant material is composted and maintenance duties are handled primarily by the owner. 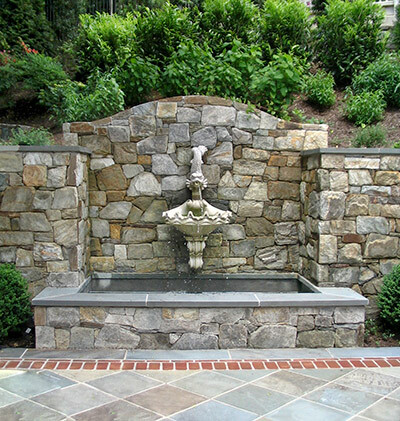 The other DC garden, designed by DCA Landscape Architects and maintained by our company, is an impressive example of dealing with a challenging, steeply sloped site in order to create spaces for entertaining, a spa and fountain, storage, and circulation while providing screening from surrounding properties and a plant palette designed to soften the expansive hardscaping. 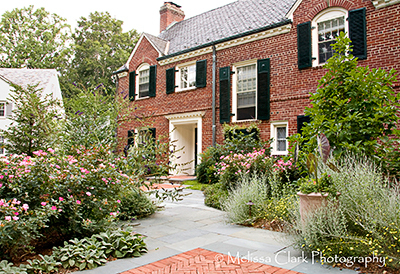 Another garden on the May tour in the Cleveland Park area, designed by the landscape architecture firm of Fritz & Gignoux, is on Newark Street NW. It incorporates Arts & Crafts elements in the hardscape design (think custom-made stone-faced columns supporting wisteria on the patio, and a whimsical weathervane with a mermaid holding a star). The plantings are lush and cottage-style with a natural feel to them, and a “writer’s cottage” perches on a hill at the rear of the garden, offering beautiful views back towards the house. The view from the "writer's cottage" in the Cleveland Park garden on the Open Days tour. 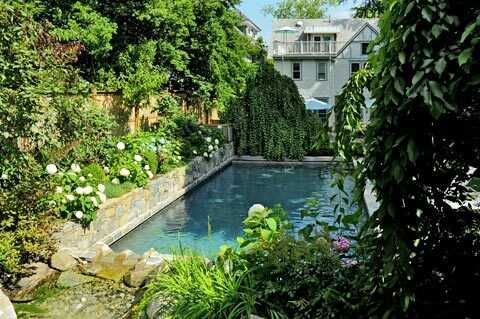 Photo courtesy of Fritz & Gignoux Landscape Architects. All of these gardens will enrich the gardening knowledge and provide pleasure for any visitor. For e-mail alerts about the schedule for tour days you can sign up on their website. Booklets of discounted tickets can be purchased online at www.gardenconservancy.org in advance; and if you become a member, you will receive a copy of the 2010 Open Days Directory with descriptions and open dates for hundreds of gardens across the country. What are you waiting for? Mark your calendars! 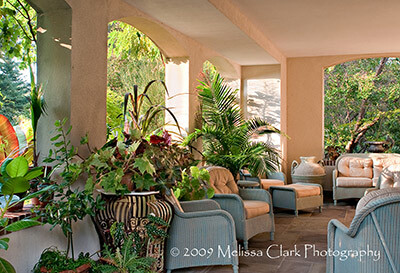 Photos from these gardens are included in my Open Days Tour book, available through Blurb.com. See “My Books” for a preview or to order a copy. Thanks! Last weekend I dragged a dear friend and colleague from my design firm off to the wilds of New Jersey to see Silas Mountsier’s garden. 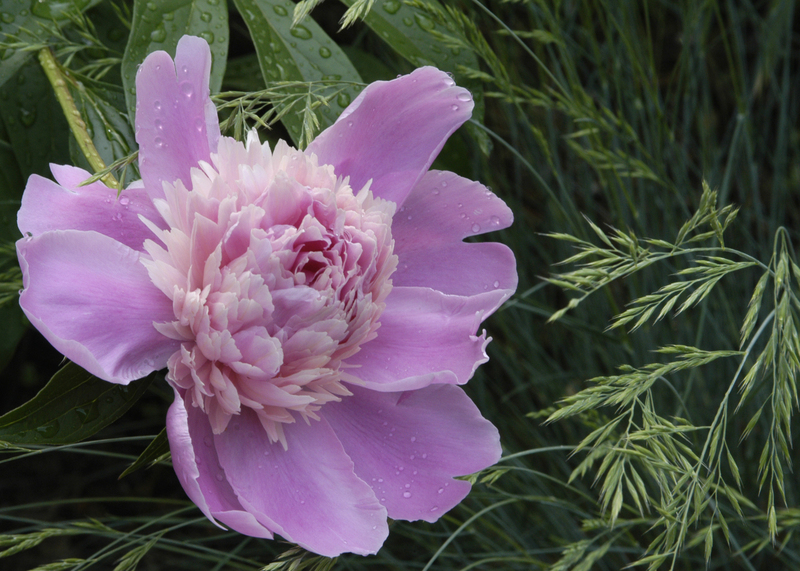 It was open as part of the Garden Conservancy’s Open Days program this spring. I last visited this garden in 2004, en route to my Hudson River Valley garden tour – and that visit was in late summer. 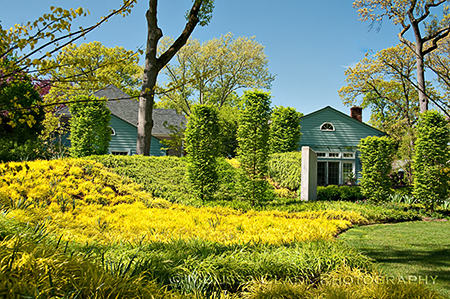 By now, the garden has expanded from a mere one-acre jaw-dropping delight to an expanse of nearly four acres. Richard Hartlage remains the design genius behind it all; both he and Mountsier spent time talking with us at some length about the garden and encouraged us to return in September, when it will be open again. (We can’t wait). 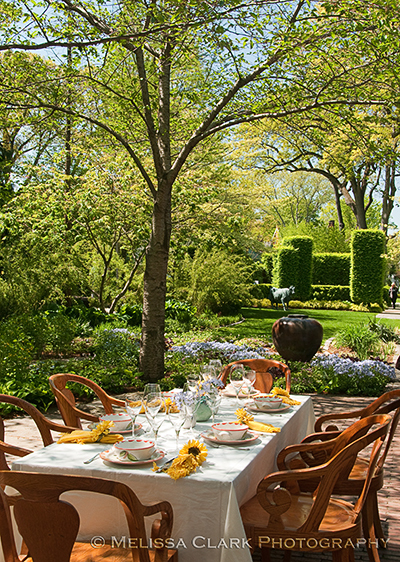 In the meantime, we can fantasize about what it might be like to have dinner in the garden. Very “Luncheon of the Boating Party”-like, don’t you agree? To the right of this splendidly set table is a small guest house, designed to look like Mr. Mountsier’s home but also outfitted with a wonderful kitchen that makes it easier to have outdoor dinner parties. The Mandrill Sculpture in the main garden, along with a "rabbit-hole" brass sculptural indentation in the bed of clipped dwarf mondo grass. Kripa and I fell in love with a small shade perennial which Hartlage told us was Lathyrus vernis, a member of the sweet pea family which is hard to find but beautiful where it is happy. 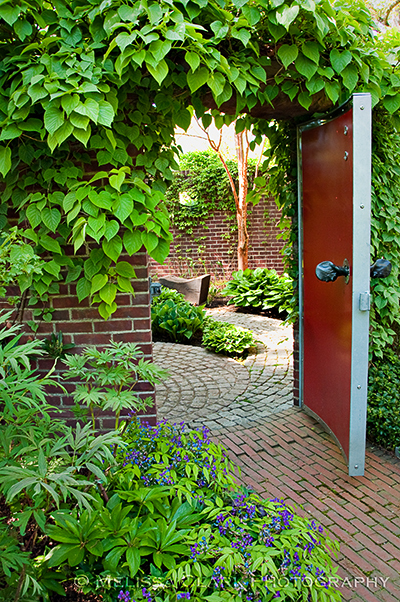 A door leading from one part of the Mountsier garden to another, with Lathyrus vernis in the foreground. Beyond the original garden lies the newest part of the landscape. Like the garden closer to the house, the new expanse incorporates clipped hornbeams and unusual perennials that were familiar to us. Bermed-up sections of the landscape, however, are planted in ten thousand Hakone grass plants in varying hues, and are anchored by two large concrete walls. Hartlage told us he has planted different kinds of ivies that will grow up the walls in “stripes,” to be clipped by Mountsier’s longstanding, gifted gardener Mario (whom we met at the end of our visit). One of the Hakone grass hills anchored by a concrete wall in the new portion of the Mountsier garden. Hartlage will plant the large Siebert & Rice 'tom' containers with clipped basil balls later in the summer. Clipped hornbeams near the concrete walls in the new area of the garden. At the end of our visit, we thanked Hartlage and Mountsier again for their generosity and hospitality. Kripa came away with some design ideas for a garden plan she’s working on. I had struggled all day with the sun, trying to outwit it in my photographic efforts; but like Kripa, the garden inspired me and helped revitalize my creative energies. So we look forward to visiting it again in the fall. If you live within driving distance, I hope you’ll join us.